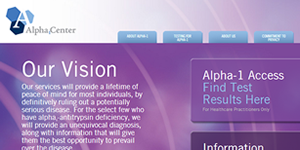 The Alpha1Access Physician Web Portal is our 2nd major project for Alpha1Center medical lab. The primary purpose of this portal is to allow Alpha1Center’s physician clients and their office staff to log in and get their patient’s Alpha1Center test results instantly and anytime. Physicians can also submit address changes, office staff changes, and request test kits, saving phone calls and phone tag between Alpha1Center and the physician offices. HIPAA compliance and staff security were the most challenging development tasks with this particular web application, expecially since the website is used in an office environment with shared computers. The concerns are when browser back buttons and history or “copy and paste” URLs can display private information and violate HIPAA regulations. Another security challenge with this website is the physician/staff relationships. Physicians may have multiple offices where staff may work at only some or all those locations. Patients may be seen at only one or all locations also. Office staff must only have access to patient records for offices where they work. Physicians and staff must also be reminded to delete access whenever staff leave the physician’s employment. Logins must automatically be removed if not used consistently to help maintain HIPAA compliance and protect patient information.